If all goes according to schedule SEGA, Sonic Riders Free Xbox 360 lands in the U.S. starting in November. The report falls in line with Microsoft’s claims of the game being a launch title for Kinect, which is hitting stores that same month. Until now SEGA’s official word on Sonic Free Riders release date has been “late 2010” in both the U.S. and Europe. Ah Sonic Free Riders… the Sonic game that nobody cares about. Who is this nobody you’re talking about? I cannot wait for this game, I’m gonna get this with both Sonic 4, Sonic Colors. Have you not read the forums? Too bad I can’t haz 360 – this game actually looks promising. No buy, because I’m not buying a dumb Kinect just for this. This game is certainly looking decent. Too bad I won’t be getting it (No Xbox Live access, and no desire to buy a Kinect). Looks like crap, the character models still are big legs, no signal to appear Chaotix or Metalsonic, SEGA fill that space inda roster to put more stupid generic robots. Still won’t but it I would if it had a controller option but it’s a no good I rather play Zero Gravity on the Wii with my GC controller. Sorry but kinect looks stupid. No thanks. Only if there’s a controller option. And only then, will I play this. um buy or not to buy that is the question. All this complaining makes me moist…. :F Cause I feel the same way. Maybe if enough people complain, they’ll finally add the damn controller function. Because if they’re not going to make a controller option, or add any new characters, then honestly, what’s worth playing in this game? It looks JUST like the past games, only with (much) better visuals. But that’s really not worth buying a Kinect for…. Kinect ruins this whole game for me. Still curious who voices Jet. His legs are normal size in this game and seriously, graphics mean nothing. And seriously? We don’t know how many characters there are. no thanks….Kinect is too pricy for me just to buy this game alone. But instead of only Kinect…. ONLY FOR Wii AND PS3!!! The character models actually look strikingly more proportional than the last two Riders games. I like. As much as I think this game looks cool… I’m not sure if I’m willing to shell out more money for Kinect on top of the other Sonic games coming out. If I ever get to try a demo, maybe that’ll sell me on it. The character models look awesome, and the graphics are nice. I’m curious as to what Jet will sound like. Can you only use the Kinect with the new Xbox console? No, you can use Kinect on any Xbox 360, but the game is Kinect only, an employee @ SEGA confirmed that a month ago. I figure it’s a big waste of money, paying 150 bucks for a “camera” so you can get a seperate game that costs 50 bucks that doesn’t look like it’ll be a groundbreaker. But, heck, It’s Sonic the Hedgehog. Well, he does have a point. On the first one, they added those random Eggbots. On Zero G, they added the MeteorTech bots that couldn’t do crap. Seriously, SEGA. Making up new characters is not the way to go. Stick with the ones you have and make them feel more at home in the Sonicverse(ie, silver, blaze). I’ve only played the first on PC, but the controls were so wild and difficult I didn’t even finish the game. And seeing as this game is developed for Kinect… I guess we’ll see how stable the gameplay is. I can understand the venom for this after the first Riders game but Zero Gravity was actually spectacular, at least as far as level design and story go. I hope this game does have a storyline and that the cutscenes are as incredible. … I love how people are saying that SEGA ruined the line of good Sonic games by announcing this… I’m sorry people, but don’t get butthurt over things you A.) Haven’t played, and B.) Are bitching about because you don’t have the means to play this. Guess what, people who do buy the peripherals need games to play too. That’s just the opposite for me actually! I loved the first and hated the second! The game is going to own bigtime! Now Jet The Hawk will finally sound awesome. It ia very expensive though.. I really have to wonder how. I can understand if you like the difficulty, but Zero Gravity (at least with a non wii remote control option) has more refined gameplay, better game mechanics, better cutscenes and a really cool story to boot. 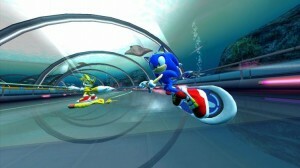 Sonic Riders 1 in everything but difficulty was tepid. Boring level design, bad controls, hard to use or useless mechanics, boring story, etc. It looks cool and finally gives Sonic Riders a purpose. It’s on a hoverboard so it makes sense to use motion capture. =) People complained about the first two sucking anyways. At least this one has a fitting gameplay style. The models are different than the first two even. Their legs and arms are normal now and Sonic’s face looks less like in SA2 and more like in Sonic Unleashed. I hated Sonic on the Wii cuz his gameplay style doesn’t fit Wii-only controls. But this fits full physical motion capture. So I like the idea. As long as they don’t make a buncha games only suitable for controllers for Kinect like Wii did, I’m good. Enough of this “only” business. If the game CAN be played with the controls available on multiple platforms, it shouldn’t be exclusive. Exclusive isn’t fair and should only be done IF a game can only use the Kinect or Wii. How can anyone think the Kinect looks stupid? It’s freakin amazing! What’s wrong with it? If it’s not your style then don’t get it but there’s nothing bad about it. And everyone who keeps saying “It’s not worth buying a Kinect over”… it’s not SUPPOSE to be. You’re suppose to buy a Kinect to play games that you like that require the Kinect which you supposedly like if you actually buy it. If you don’t, then you don’t like Kinect or any games that use it’s gameplay, and if so then stop worrying about it! So those people who are buying kinect just for this game… Kinect = £130 Free Riders = £30… £160 to play Sonic Riders 3…. You will be laughed out the shop.